By Peter Bander van Duren Coat of Arms No. 112, Winter 1979. 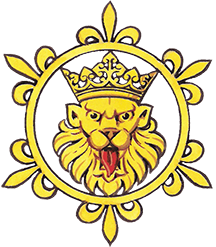 Although heraldry has been part of the Catholic Church’s historic heritage since the thirteenth century, it is a sad fact that during the following seven centuries the armorial art and science gradually degenerated, until hideous heraldic monstrosities had become a common feature among ambitious and pompous ecclesiastical armigers. Successive popes from Clement X (in 1644) to Pius XII (in 1951) tried to curb such heraldic abuses, but papal decrees dealing with heraldic subjects were more prohibitive in tenor than instructive and little guidance was offered. But for the extraordinary renaissance Catholic heraldry has enjoyed during the last three decades, ecclesiastical heraldry might easily have become absorbed and completely governed by the civil heraldic law of individual nations. Instead of speaking of tradition upon which present practice is built, we would probably be looking upon Catholic heraldry as past history and perhaps an art form which reflects past glories of temporal power. The astonishing achievement of bringing about this renaissance of Catholic heraldry belongs principally to one man: Archbishop Bruno Bernard Heim. Although there is no such position or title as ‘Herald of Arms’ in the Catholic Church, Archbishop Heim has been the de facto authority on heraldry in the Catholic Church since the reign of Pope John XXIII. In November 1978, Mgr. Heim’s Heraldry in the Catholic Church – Its Origin, Customs and Laws was published. (1) Osservatore Romano, the Holy See’s official organ, called Archbishop Heim’s work “the only reliable guide on Catholic heraldry” and continued with a strong recommendation that in future bishops and prelates wishing to adopt arms should seek counsel of the Archbishop before doing so. Another commentator qualified his high opinion of Mgr. Heim’s opus magnum when he wrote: ” in this case not only is our guide the greatest expert of our own age but of all time.” Christian World, Oxford. An objective analysis of how one man was able to achieve unrivalled expertise and implement it in his pursuits must begin with the man himself. Born in Olten, (Solothurn), Switzerland, Bruno Bernard Heim displayed extraordinary artistic talents as a boy. An early and significant influence on him was one of the professors at his school, who was a prolific writer on heraldic subjects. However, the learned scholar lacked any artistic ability to draw or paint, and in his early teens, Bruno Heim’s exceptional gift as an artist was used to illustrate the many heraldic articles by his professor. In the course of years, Bruno Heim acquired an almost encyclopedic knowledge of the science of heraldry, and although he entered the Church’s ministry, heraldry remained the subject to which he gave much of his free time. Because of his academic brilliance, the young priest, who had already gained a doctorate during his early training, continued his studies at Angelicum and the Gregorian Universities in Rome, where he added further doctorates and honours to his qualifications. He was then invited to study at the Pontifical Academy for Diplomats, and considering that this illustrious institution was until Pope Pius XII quaintly named ‘Pontifical Academy for Noble Ecclesiastics’, whose students were drawn from very select circles, mainly of Italian parentage, the young Swiss parish priest must have shown exceptional qualities to have been invited to enter the Holy See’s diplomatic service. Shortly after World War II, Bruno Bernard Heim was appointed to his first diplomatic post: Attaché and Secretary to the Papal Nuncio in Paris. There is no doubt that during the four and a half years he spent in Paris, Mgr. Heim laid the foundations for the renaissance of Catholic heraldry. The Papal Nuncio to whom he had been sent as Secretary was Archbishop Angelo Giuseppe Roncalli, who has become far better known as Pope John XXIII. A little known fact is that Archbishop Roncalli shared Mgr. Heim’s interest in heraldry. I have examined many records which show that during the period of collaboration between Archbishop Roncalli and Mgr. Heim, the Nuncio used his gentle but irresistible persuasion and the heraldic expertise of his secretary in bringing about a change of attitude towards heraldry among many high and influential dignitaries in the Church. It was during those fruitful years that the Catholic Church was purged of many baroque armorial monstrosities then commonly in use. But this purging was not done by papal decree but through educating, enlightening and mainly by offering an alternative to heraldic monstrosities. Catholic heraldry gradually returned to medieval simplicity and beauty. When after four and a half years Mgr Heim took up more senior diplomatic appointments in Austria and Germany, he was by then not only well established as an authority on the Church’s heraldry, but his ideas and his taste for simplicity and beauty in heraldic design had already permeated a considerable part of the Church’s hierarchy. Of course, there were still many of the ‘back-street heralds’ kept busy in Rome, who, for a fee designed the most hideous coats of arms for newly consecrated bishops; they worked willingly to the wishes and often fantastic requests of heraldically naïve armigers nouveaux. In 1958 Cardinal Angelo Giuseppe Roncalli was elected Pope and he asked Monsignor Heim to design the new papal coat of arms. The psychological effect of the Pope’s request was twofold. By his action the Pope had left no doubt as to whom he considered to be the Authority on heraldic matters. Many cardinals, bishops and prelates followed suit and took Mgr. Heim’s counsel before adopting their arms. But in a subtle, though I believe quite unintentional way, the arms of Pope John became very popular. At his coronation they were displayed on a huge tapestry which was hung from the central balcony of St. Peter’s; the Pope’s apartments were decorated with Damascene tapestries bearing his coat of arms; the arms appeared on postage stamps and coins, and the Great Seal of Pope John featured the arms prominently. There were many such factors which contributed to the new climate in heraldic appreciation. n 1961 Pope John appointed Monsignor Heim Archbishop and Apostolic Delegate to Scandinavia. At the same time Heim continued his work as ‘Herald Extraordinary’. Pope Paul VI, who succeeded Pope John, did not have his predecessor’s knowledge of heraldry. Upon his election he asked Archbishop Heim to design the papal coat of arms but – and I am expressing here a personal opinion – Pope Paul allowed artistic representations to be made of Archbishop Heim’s armorial designs, which seemed to be more pleasing to connoisseurs of abstract art than to heralds. However, abstract artistic representations were not only made of heraldic designs but of almost anything, and therefore I do not think that the renaissance of Catholic heraldry was unduly affected by this temporary trend during the Pontiff’s reign. Above Left: The Pontifical Insignia, the tiara and crossed keys, are borne by pontifical institutions and papal missions abroad. Above Right: The arms of the Papacy and of the Vatican State show the pontifical insignia on a shield gules. The Vatican flag, still commonly in use, shows the pontifical insignia on the sinister side of the flag which is argent (the Or side being next to the staff on the heraldic dexter). Archbishop Heim argued that the Vatican flag should be changed and the shield gules with the pontifical insignia placed in the middle of the flag. Several papal missions in Europe have used this, but no official decree has been promulgated. At a conservative estimate, Archbishop Heim has designed some three thousand coats of arms for cardinals, bishops, prelates, religious institutions apart from armorial designs for personal friends. In contrast to the heavily overloaded arms used by ecclesiastical armigers until the early 1950s, coats of arms adopted by archbishops and bishops in the second half of this century are simple and feature apart from the shield only the hierarchical achievements, the hat, (ten tassels pending either side for archbishops and six tassels for bishops) and the cross. The archiepiscopal cross (double traversed) or the episcopal cross (single traversed) are the only reliable hierarchical achievements which indicate the rank of the bearer. Abbots, for example, are also entitled to a hat with six tassels either side (as are several ranks of Monsignori), but abbots have the veiled crozier as their hierarchical achievement of dignity. For reasons of simplicity, Archbishop Heim, for example, only uses the double traversed cross as his achievement because it is sufficient to show his rank as archbishop. However, two heraldic errors in hierarchical achievements for Catholic dignitaries still occur: bishops who feature a crozier and mitre assume – at least heraldically -the rank of an abbot. (This does not apply to hierarchical achievements in the Anglican Church, where the correct achievement for bishops is the mitre). A second error occurs among the heraldic achievements of cardinals. A cardinal is entitled to a hat with fifteen tassels pending either side. Until very recently cardinal deacons were not necessarily consecrated bishops or archbishops, and their proper achievement would have been the hat with the fifteen tassels pending either side of shield. However, as now all cardinals (deacons, priests and bishops) are consecrated bishops or archbishops, those who feature only the cardinal’s hat as their heraldic achievement and omit the cross appropriate to their rank, quite inadvertently demote themselves to the rank of a lay cardinal and holder of an office which has been abolished. Another significant factor which contributed to the practical implementation of Mgr. Heim’s heraldic reformation, has been his collaboration with Mr. Rudolf Niedballa of Germany, who has been acclaimed as the finest heraldic engraver of our era. Mr. Niedballa has engraved many episcopal, diocesan and even four papal seals after the designs of Mgr. Heim. He also has engraved and personally printed the writing paper of the last four popes. Archbishop Heim’s appointment as Papal Delegate to Great Britain in October 1973 can be regarded as a milestone in his endeavour to consolidate the renaissance of Catholic heraldry. I don’t think I am betraying Mgr. Heim’s confidence when I reveal that he has always regarded the United Kingdom as the Holy Grail of Heraldry. Its custodians and trustees, the Kings of Arms, the Heralds and Pursuivants welcomed him upon his arrival as an honoured and distinguished fellow herald; many of them have become his personal friends. The years that followed have borne the fruits of this friendship, collaboration and mutual respect. It was no coincidence that Archbishop Heim’s opus magnum, Heraldry in the Catholic Church, was published first in Britain, and the author’s warmly expressed gratitude to the College of Arms and The Heraldry Society testifies to the esteem in which he holds these two institutions. 1978 has become known as the year of the three popes. The demands on Archbishop Heim for new papal arms, seals and insignia for two new papal administrations and other armorial designs became at times so heavy that, for example, following the election of Cardinal Luciani to the papacy, Mgr. Heim spent eighteen hours without a break on the designs for Pope John Paul I. It is customary that within a few hours of a papal election the Sostituto, Under Secretary of State, who is then the acting head of the Holy See’s administration requests the drawing up of new papal arms for the elected pontiff. Papal arms are published on the morning of the Pope’s enthronement. In the case of Pope John Paul I, I remember that some threatened airport strike caused a great deal of trouble. The papal courier, anxious to get the designs for the Pope’s coat of arms to Rome, was waiting downstairs at the Apostolic Delegation, while Archbishop Heim was putting the final touches to the armorial paintings upstairs in his study. It was very sad that Pope John Paul I died thirty three days later, in fact on the very day the newly engraved papal seal had arrived. A Pope’s personal wishes concerning his armorial bearings are always respected. Pope John XXIII worked for ten days with Mgr. Heim on the perfection of the coat of arms he wanted. The different designs Mgr. Heim executed and the delightfully humorous comments made by Pope John on some of the designs, have, thankfully, been preserved for posterity in Archbishop Heim’s book. When Pope John made Archbishop Montini a Cardinal in 1958, Archbishop Heim used the Montini family arms, slightly modifying the heraldic charges and designing a shield more suitable for hierarchical achievements. In 1963 Cardinal Montini became Pope, and Mgr. Heim only needed to design new papal insignia. Pope John Paul I requested entirely new arms to be drawn up. He wished to commemorate his two predecessors, Popes John and Paul, and Archbishop Heim incorporated Pope John’s lion and the Montini mountains in the shield. The Pope’s personal charges were three five-pointed stars Or on a shield azure. Archbishop Heim has always stressed that letters of the alphabet should not be used as heraldic charges.2 As far as the letter ‘M’ is concerned, it denotes devotion to the Blessed Virgin Mary, and Mgr. Heim had suggested several heraldic symbols. However, Mgr. Heim has always respected national idiosyncrasies in heraldry, and the use of ornate letters is quite common in Poland and in Switzerland. As the world has learned during the short reign of Pope John Paul II, he takes a deep and sincere interest in every issue which is brought to his attention. The heraldic problems put to His Holiness by Archbishop Heim were no exception. There were two main suggestions which the Archbishop put forward: the letter ‘M’ might be substituted with an appropriate symbol which would express the Pope’s devotion to the Virgin Mary and also the colour of the charges should be changed, the shield to the proper heraldic azure and the charges to Or. The Pope readily agreed to the suggestion concerning the colours of shield and charges. The argument for changing the letter ‘M’ and substituting it with a symbol could be strengthened on the grounds that Karol Wojtyła had effectively ceased being a Polish Archbishop, bearing Polish arms, on becoming Supreme Pontiff of the Universal Church. 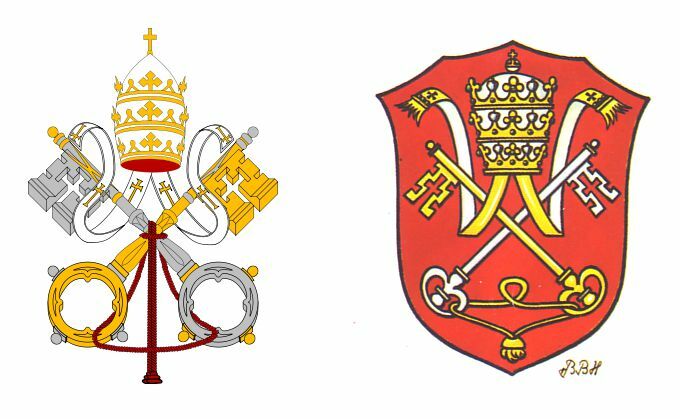 The arguments against changing the heraldic charges and retaining the letter ‘M’ also command the respect and acceptance by the purest of heraldic scholars: Pope John Paul II was proud to be a Pole, and he had borne the arms when he fought and laboured so hard among his beloved people of Krakow. Was it not reasonable to assume that the ordinary people of his native land, who had no knowledge of the niceties and intricacies of heraldic design, would feel hurt if the Pope were to change his coat of arms? However, His Holiness was presented with five different designs, three with a symbol as the heraldic charge and two with the letter ‘M’ retained. After further consultation, the Pope decided to retain the letter ‘M’, especially as the cross and ‘M’ Or on azure were aesthetically pleasing, It is interesting to ponder on the fact that the arms of Pope John Paul II have become the best known heraldic device throughout the world and in only eighteen months! In August 1979 the Vatican announced the forthcoming visit by the Pope to Ireland and the United States. Because of political circumstances, the Holy Father emphasised that he was making a pastoral visit and not a state visit. Archbishop Heim, who has always regarded heraldry as a living art form, immediately conceived the idea that the Pope’s pastoral role in the country he would visit could be expressed heraldically. He adapted the official papal arms and placed them in a Celtic setting. For example, the crosses on the bands of the tiara became shamrocks, an ancient Irish symbol of the Holy Trinity used by St. Patrick. The adapted shield and papal insignia were placed in a round field, again an ancient Celtic tradition which goes back to centuries long before heraldic devices occupied the central position of such shields. The broad band surrounding the shield was decorated with another symbol. Mgr. Heim chose the harp, which is not only of Celtic origin but also often used in heraldry. He repeated a similar design, though not in full heraldic colours but Or with a border of shamrocks vert. Archbishop Heim’s designs commemorating the Pope’s pastoral visit have inspired world famous craftsmen to preserve them for posterity on exquisite objets d’art. The Harcourt Chalice in engraved crystal, by Baccarat of France, is already in use as communion chalice in several abbeys and cathedrals. It cannot be ruled out that the precedent set by Archbishop Heim in giving the pastoral aspect of a Pope’s visit an armorial expression, will commend itself to the Pope and the Holy See for future visits of the Supreme Pastor to other countries. Mgr. Heim has added a new and exciting dimension to Catholic heraldry. Among the heraldic works from the pen and brush of Bruno Bernard Heim will be a companion volume to his Heraldry in the Catholic Church, dealing with the many developments in Catholic heraldry since the death of Pope Paul VI and important issues arising from his opus magnum? a work on the use of metals in heraldry 5 and the ultimate pièce de résistance, a facsimile copy of his famous Liber Amicorum et Illustrorum Hospitum,6 which was recently described in the Sunday Telegraph as “not only unique but the most exclusive armorial ever to have been compiled”. In January 1980 the Holy See asked Archbishop Heim to adapt the papal arms for use on programmes; brochures and similar material issued in the Vatican especially for papal audiences (see: The Heraldry Gazette, No. 80, Feb. 1980). It appears that the adaptation of the arms for the pastoral visit of the Pope in 1979 had been received well and that the precedent set then by Archbishop Heim has indeed commended itself to the Pope and the Holy See. Heraldry in the Catholic Church – Its Origin, Customs and Laws, by Archbishop Dr. Bruno B. Heim. £22.00 (Sterling), Van Duren. ibid. : VIII, The Drawing-up of Arms for Prelates, pp. 148 ff. Six heraldic objets d’art were commissioned in limited editions by Gaius International Ltd., 1 Tudor Lodge, Grand Avenue, London N.10, under an exclusive licence granted to Gaius by Van Duren. Illustrated catalogues of the objets d’art are available on request from Gaius. The second, enlarged edition of Heraldry in the Catholic Church will be published in 1980. The Archbishop’s publisher will also issue biennial illustrated supplements with the new designs, papal decrees and armorial innovations in the Catholic Church. Or & Argent: An investigation into the purported rules concerning the use of metals in heraldry. This work is scheduled as a limited edition of 1,000 copies, printed in two colours throughout and in English and German. Scheduled for Winter 1980.